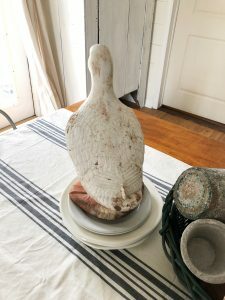 I have to share a recent favorite antique store find with my like minded vintage loving friends! The old ducky duck came just in time for SPRING!! For less than $10, I knew ducky duck would find a home.. possibly my home. I wasn’t totally sure what I would do with her but I knew if nothing else I could make a profit if I decided to put her in the booth rather than my home. Ducky duck is mostly off white. I’m sure once upon a time she was white but she’s aged with grace. Her sweet beak is orange which adds just a little pop of color. Not much, but in some places her her paint has chipped off over time.. Again, she’s aged well. With her chippy charm I figured she would look good on our porch.. perhaps by the front door. 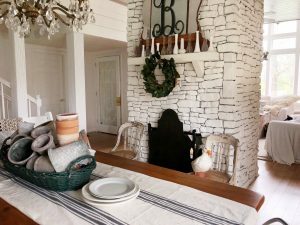 Turns out she actually looks great inside our farmhouse too! So she found a spot sitting in a chair in our dining room. 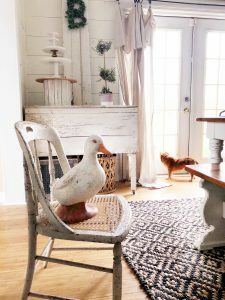 You’ll probably spot ducky duck in many different places throughout our home for a while and when you do, you’ll know how/where I found this sweet duck! 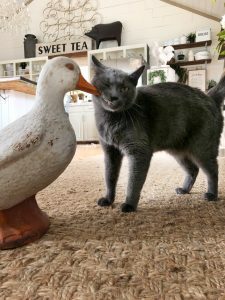 Thank so much for dropping by my blog today and readying about ducky duck!